Central sensor Expand (by necessity)/AI Servo/Rear Focus AF just caught the bird’s neck active at the moment of exposure. Click here if you missed the Rear Focus Tutorial. Click on the image to see a larger version. I was thrilled that this gorgeous species was present in great numbers. I fanned on a few good chances and though I liked the pose in the image above, it was not the sharpest image ever created. I darkened the pupil and ran a 25% layer of NIK Color Efex Pro Detail Extractor & Tonal Contrast plus a Contrast Mask on the bird only and was happy with the optimized image above. See the animated GIF immediately below to see the before and after images. Give the animated GIF a few moments to play and note the Digital Eye Doctor work, the NIK work, the filling in of the canvas using the John Heado Content Aware Fill method, the color correction work, and the zebra turd clean-up work. All as described in detail in Digital Basics. Digital Basics is an instructional PDF that is sent via e-mail. It includes my complete digital workflow, dozens of great Photoshop tips including Digital Eye Doctor techniques, several different ways of expanding canvas, all of my time-saving Keyboard Shortcuts, Quick Masking, Layer Masking and NIK Color Efex Pro basics, creating and using time-saving Actions, and tons more. This is Lou Coetzer’s winning image from the 1st competition. Thanks to yeoman work by the BAA competition team, Peter Kes, Denise Ippolito, and yours truly, the BIRDS AS ART 2nd International Bird Photography Competition is now open. We are ready to see your best images. And we are truly excited. This year’s streamlined contest has 8 categories and offers 119 prizes including the $1,000 first prize: a check for $500 from BIRDS AS ART and a $500 gift certificate from major contest sponsor B&H. The 25 winning and honored images will share the 119 item prize pool. Click here to visit the competition page. Click here to see all the winning images from last year’s competition. Click here to read the rules that include the most liberal digital guidelines of any major contest. Click here for payment options. Click here to learn about our panel of prestitgious judges. Click here to check out the prize pool. Wow. This is exciting! As most of you know, I have–for the past 30 years–dedicated my life to making beautiful images of birds and teaching others to do the same. The second edition of this contest is simply an extension of that passion. Thanks to Denise Ippolito for her help organizing the contest and to Peter Kes for building the web and upload pages; Peter re-designed both the blog and the website about four years ago and helps me almost daily; his skills and work ethic are superb. I cannot begin to talk about the contest without talking first about the incredible generosity of our many sponsors. I knew from the get-go that as the new kid on the block that we would need to assemble a huge prize pool. I asked and they gave. A huge thanks to Yechiel Orgel of principal sponsor B&H PHOTO & VIDEO. Thanks to Martin Wood and Anna Lopez of Delkin Devices for their continued support. Thanks to Clay Wimberley at Wimberley, to Walter (son) and John (father) at 4th Generation Design, and to Scott Elowitz of LensCoat. Special thanks to Helen Longest-Saccone at Nature Photographer Magazine who will be publishing the winners in a print edition of Nature Photographer magazine. Thanks again to Brian Erwin at Think Tank. (For the 2nd straight year Brian OKed my e-mail request for support in seconds; I hit send and moments later I got his “I’m in” response.) Thanks to Michael Tapes of Raw Workflow, John Stanford of Vertex Photographic, John Storrie of Vested Interest, and Bob Peltz of Essential Photo Gear. All of those mentioned above are with us for year two. Special thanks to new sponsor Chris Klapheke of Outdoor Photo Gear. We are direct competitors in the mail order business yet we have remained good friends over the years. OPG carries a lot more stuff than the BAA store; if you can’t find it here, visit OPG. Why another contest? Entering contests is fun. Having an image or two honored is always a huge thrill. I enter the BBC Wildlife Photographer of the Year Competition every year. And the same goes for the Nature’s Best and National Wildlife contests. I have had more than a few honored images in all three contests. But considering the huge popularity of bird photography today there are relatively few avian categories in the major contests. We have rectified that situation. And here is the best news of all: with the relative ease of digital photography most anyone is capable of creating a contest winning image. The BBC contest makes no distinction between amateurs and professionals and we are doing the same here. I consistently see folks photographing for only a year or two producing images with contest-winning potential. All of the major contests have very restrictive digital guidelines; you are pretty much limited to removing dust spots and adjusting brightness, color, and contrast. And some competitions allow only global adjustments, changes that affect the entire image; making selective adjustments is prohibited. Heck, Ansel Adams would have been disqualified from those. Our digital guidelines are the most generous of any major contest. By miles. With all due respect to the purists, our digital guidelines most accurately reflect the prevailing style of image optimization by allowing for the removal of distracting background elements. You can check out our digital guidelines by scrolling down to #12 here. In addition there are some rules in the major contests that simply do not make sense to me. For example, a recent BBC Wildlife Photographer of the Year winner was nowhere near his camera when the winning image was made. And several other of his camera-trap images were also honored…. All in all I simply thought that I could come up with a great contest with rules that made sense. So I did. With eight categories and a large but streamlined prize pool there are lots of reasons to enter. The entry fee is $25 for ten images. You may enter once or twice or as many times as you like. You might enter now and then again in a few months and then possibly once right before the deadline: the closing date for entries is December 31, 2013. If you make a purchase totaling $1,000 or more from contest sponsor B&H using this link you will receive a single free contest entry. Purchases of $3,000 or more will be good for two contest entries, of $5,000 or more for three entries, and of $10,000 of more for five competition entries. To receive your free entry (or entries) send your B&H receipt to us via e-mail to staffbaa@att.net and cut and paste “B&H Contest Entry” into the subject line. You will receive instructions (for uploading your images) by e-mail. My dream is that the BIRDS AS ART International Bird Photography Competition will continue to grow in prestige and soon rank right up there with the top-notch contests that I mentioned above. My hope is that at some time in the future we will have an exhibit of the winning images at the American Museum of Natural History in New York City. My interest in nature was sparked there when I was about twelve or thirteen. Imagine that I traveled alone on the subway taking the then Brighton Beach Express into the city and spending entire weekends roaming the halls. This image of a Himalayan Blue Poppy was created by Denise Ippolito with the hand held Canon 100mm macro lens (now replaced by the Canon EF 100mm f/2.8L macro IS USM lens with the Canon EOS 5D Mark III. Be sure to see more images from this series and read Denise’s “Finding What Inspires Me” in the blog post here. The Blog is the Bomb! I continue to put in 20+ hours a week towards making the blog informative, timely, and beautiful. Many of the educational features that formerly appeared in BAA Bulletins now grace the BAA Blog. If you are not subscribed, you are missing a ton of great stuff almost daily. You can subscribe to the blog posts by clicking here. If you have a problem subscribing, please contact us via e-mail. See two great collections of Waved Albatross images here and here. Learn about the Camargue & Provence France IPT here. Learn about my heightening love affair with the new Canon 200-400mm f/4L IS USM lens here. In “2-4 Giraffes and More” you will see one of my many wonderful Maasai Giraffe images from the Tanzania Summer Safari. In “A Matter of Brilliance and Perspective” you will learn what makes Todd Gustafson a great safari leader. Learn more about the great new Canon 200-400 here and here. Denise Ippolito’s spectacular series of Blue Himalayan Poppies can be seen here. You can learn what drives me to work so hard and to excel here. “Best-ever Hand Holding Tip” is one of my most popular blog posts ever. To learn why there is never a detailed itinerary on a BAA Instructional Photo-Tour click here. Like flowers or photography? Check out Depth-of-Field Lesson. Learn why I love my 5D Mark III here. You can find complete Canon telephoto lens specs here; be sure to bookmark this page for quick reference. The cart now includes data for the new Canon 200-400. All images courtesy of and copyright 2012: Denise Ippolito. Click for a larger version. As part of the Swan Island Dahlia Farm Instructional Photo-Tour, September 11-15, 2013 (Sold Out); see here for details), denise and I will be presenting a 1/2-Day Mini-Flower Photography Seminar. Folks wishing to register for the mini seminar only may do so for only $49. Denise will begin by presenting her “Bloomin’ Ideas” program, an overview of the in-the-field and post-processing techniques that she has used and developed over the past few years to create her signature look. Artie will follow with a Photoshop session that will be geared towards all levels. He’ll be sharing some of his favorite techniques and tips while working on images from the first two days of the IPT. Denise will conclude the morning seminar with a Photoshop demo; she will share her creative workflow using a variety of Photoshop filters and effects. The entire morning is designed to give you a peek into the minds of two very skilled and creative folks. To register for the Mini-Flower Photography Seminar call Jim between Monday and Thursday or on Friday morning at 863-692-0906 with your credit card in hand. Forster’s Tern from kayak by new Minimag contributor Rob Melone. The September issue of the Minimag is online now and can be accessed here. Articles include “Making Pictures” by Scott Vincent, “Bad Weather is Good” by Cheryl Slechta, Patterns in Nature by Denise Ippolito, “Grain-Glow Effect” by Frederick Ross, “Beautiful Flowers Need Cloning” by Anita Bower, “Creating a Montage” by Karen von Knobloch, “Photograph Other Subjects” by Lisa Cuchara, “Echo Effects” by Mary Stamper, “Why Do I Travel to Photograph” by Nancy Bell, and “Birds By Kayak” by new contributor Rob Melone. The Minimag is free and contains a wealth of interesting and informative information each month. Support the BAA Blog. Support the BAA Bulletins: Shop B&H here! We want and need to keep providing you with the latest free information, photography and Photoshop lessons, and all manner of related information. Show your appreciation by making your purchases immediately after clicking on any of our B&H or Amazon Affiliate links in this blog post. 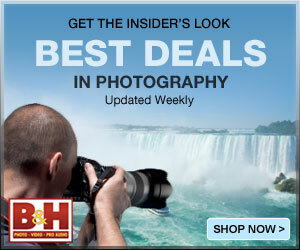 Remember, B&H ain’t just photography! If you are considering an item for purchase or comparison shopping be sure to place an item in your cart to see the too-low-to show the actual price. 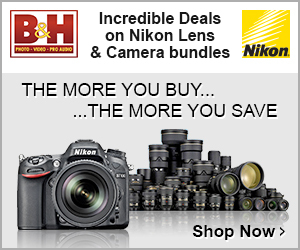 In many cases the prices are so low that B&H is forbidden from publicizing them! Everyone buys something from Amazon, be it a big lens or deodorant. Support the blog by starting your search by starting your search by clicking on the logo-link below. No purchase is too small to be appreciated; they all add up. Why make it a habit? Because I make it a habit of bringing you new images and information on an almost daily basis. LensCoats. I have a LensCoat on each of my big lenses to protect them from nicks and thus increase their re-sales value. All my big lens LensCoat stuff is in Hardwood Snow pattern. LegCoat Tripod Leg Covers. I have four tripods active and each has a Hardwood Snow LegCoat on it to help prevent further damage to my tender shoulders 🙂 And you will love them in mega-cold weather…. Gitzo GT3532 LS CF Tripod. This one replaces the GT3530LS Tripod and will last you a lifetime. Learn more about this great tripod here. Mongoose M3.6 Tripod Head. Right now this is the best tripod head around for use with lenses that weigh less than 9 pounds. For heavier lenses, check out the Wimberley V2 head. Double Bubble Level. You will find one in my camera’s hot shoe whenever I am not using flash. The Lens Align Mark II. I use the Lens Align Mark II pretty much religiously to micro-adjust all of my gear an average of once a month and always before a major trip. Enjoy our free comprehensive tutorial here. BreezeBrowser. I do not see how any digital photographer can exist without this program. Delkin Flash Cards. I use and depend on Delkin compact Flash Cards and card readers most every day. Learn more about their great 700X and 1000X cards here or about my favorite Delkin card here. For complete events and seminar info and news of the upcoming exhibition of my work in the Boston, MA area, click here. There is lots of room on the Bosque IPT and on the South Florida Mini-IPTs. And lots of room on the Holland/Tulip trip. For complete IPT info, please click here. Learn about the new Camargue & Provence France IPT here. I thought you would enjoy this piece of trivia that I read about this morning on a website called “Today in Science History”.